It is hard to believe that YouTube has only been around for 12 years. Since YouTube launched way back in 2005, it has become a factory for creating internet stars and millionaires—many of whom are not legally old enough to buy or consume an alcoholic beverage. The biggest YouTube celebrities have become masters at attracting an audience to monetize their sponsored videos and advertising. Along the way, these internet stars make a name for themselves offline too, often publishing books, or getting roles in television shows or deals from Netflix, Disney, or YouTube Red. Ask any kid or tween and they can tell you who the biggest YouTube stars are. But what they may not understand is just how much money their favorite YouTubers are making. Of the top 10 highest paid YouTube stars, the lowest paid – 29-year-old Canadian comedienne Lilly Singh – made $10.5 million. The next highest paid is six-year-old Ryan of Ryan's ToysReview. He made $11 million by opening and reviewing brand new toys. He has 10 million followers. Lilly Singh's one woman YouTube channel "Superwoman" produces music videos, comedy sketches, and other media. She has a loyal fan base of more than 12.7 million followers. Singh has also created a feature film for YouTube Red called Trip to Unicorn Island. Just two years ago, Singh was the 8th highest paid YouTube star with $2.5 million in earnings. Ryan of the YouTube channel Ryan ToysReview makes millions for his family simply by opening and reviewing new toys. Ryan is six-years-old. Think about that for a moment. His YouTube channel has over 10 million subscribers. Smosh is a YouTube channel started by comedians Ian Hecox and Anthony Padilla. Smosh is one of the first YouTube viral sensations. The channel parodies video games and pop culture as well as produces slapstick comedy videos. In June 2017, Padilla left Smosh to start his own YouTube channel. He's racked up more than two million followers in the past six months. Jake Paul was a personality on Vine before it went under. He and his older brother Logan Paul created comedic shorts. Jake now has his own YouTube channel where he posts comedy videos and original music for his more than 12 million followers. The 20-year-old has also garnered somewhat of villainous reputation for loud parties and pranks in the West Hollywood neighborhood where he rented a home. PewDiePie is a Swedish video game commenter. His videos show him playing video games while a box at the top corner of the screen shows his reactions to what is happening. He has more than 58 million followers. Earlier this year, he ran into trouble when anti-Semitic messages were found in his videos. PewDiePie posted a video on January 11th that featured two men laughing as they held a sign that said, "Death To All Jews." The 27-year-old had landed a multimillion-dollar deal with Disney to launch his own network. He was found to have made 10 videos with anti-Semitic comments or Nazi imagery. This led Disney and YouTube to sever ties with him, although he has not been banned by YouTube. Markiplier's YouTube channel is focused on gaming and his energetic personality has attracted more than 18 million followers to his content. Mark Fischbach plans to use his internet celebrity to launch a music and acting career. 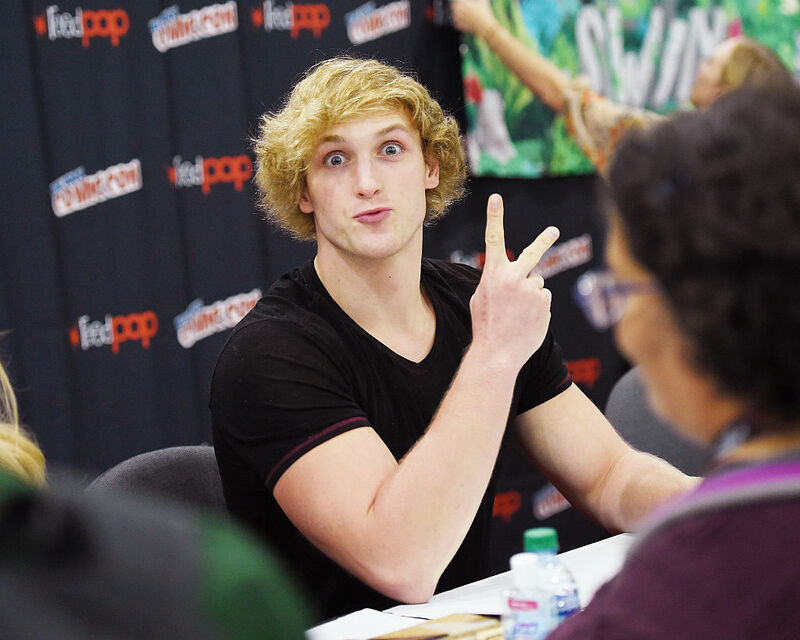 Logan Paul is the 22-year-old former Vine star and older brother of Jake Paul. He has over 14 million followers on his personal YouTube account. Logan posts comedic reaction videos and vlogs. Dude Perfect is the brainchild of twins Cory and Coby Cotton and three other friends from Texas A&M. All five of the young men are former high school basketball players. They make comedy videos and do sports tricks. Evan Fong is a 25-year-old Canadian who launched the VanossGaming YouTube channel. He posts comedic videos of him playing video games. Daniel Middleton is a 26-year-old known as TheDiamondMinecart. His channel focuses on the popular video game Minecraft. He posts daily reviews and gameplay videos. In the past year, Middleton had a world tour that included four sold out nights at the Sydney Opera House. These ten YouTube acts did very well for themselves during the last fiscal year.